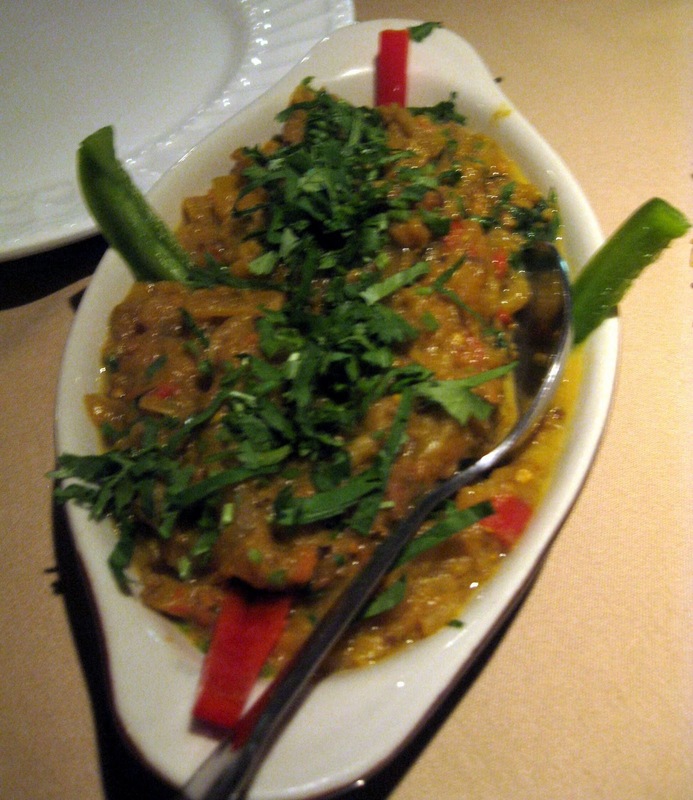 Bombay Tandoori & Banquet is a tale of two restaurants: the restaurant itself and the banquet hall. The restaurant, I recommend; the banquet hall, I don't. The Details: Via various leadership classes, I've learned to employ the "compliment sandwich" technique of delivering criticism -- in which the negative comments are placed between two compliments on either end. (Sneaky, huh?) Supposedly, it's a good technique when the entity on the receiving end has a lot of potential but needs select improvements. The good: The decor is appropriate -- I especially liked the hanging Indian-style fabrics draped from the ceiling. The bad: Banquet hall guests were not allowed to park in Bombay Tandoori's own parking lot. When asked where we should park, the parking attendant shrugged his shoulders. (As a side note, that must be an easy job -- being a parking attendant for a parking lot where no one is allowed to park!) He mumbled something to the effect of, "We have to keep the lot open for restaurant customers." Ironically, after Bobby (Nick's brother) and I (with Nick) parked seven and three blocks away, respectively, we did end up becoming restaurant customers. But more on that later. So, half an hour later after we'd trudged back to the restaurant, there was indeed a sign in front of the banquet hall that said if you parked in its lot you would be towed...sucker! (Well, the sucker part may have been added by me. But it was implied.) During dinner (in the restaurant part of the establishment), we actually saw a tow truck pull up. It's been a few weeks since this event, and I'm crossing my fingers that those poor Nepalese aunties and uncles have finally made it back home. The event, a celebration sponsored by a Nepalese association, had started at 6 p.m., or about an hour before we arrived. We'd each paid the requested $20 event donation, then made a beeline for the buffet table. The items set out so far were appetizers. At about 7:45 p.m., we were starving, the scheduled entertainment hadn't started yet, and we decided to order food in the restaurant (restaurant review starts in 4 paragraphs). At this point, I was seriously wondering if the room was over capacity -- all of the tables had long been filled, we were sitting in seats placed around the room's border, and some people were without seats altogether. I searched for the "max room capacity" sign and quickly found it near the entrance -- but instead of a number, it was blank. I later found out that Bombay Tandoori says the banquet hall holds up to 250 people, but I think they must counting the seats that are immediately outside of the banquet hall. The good: Service, in the form of picking up empty plates and the like, was prompt. All in all, I don't think this space works for a large event. But, if you have a smaller event of 60 guests or below, don't need to use the dance floor for performances (or can get a stage built on it -- that would likely have solved the sight-lines problem), and are able to negotiate use of the parking lot, then it might work for you. 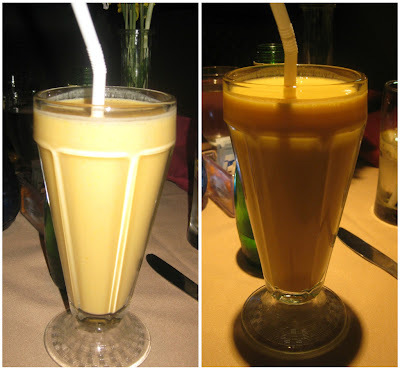 The prompt and courteous service continued in the restaurant portion of Bombay Tandoori. Our server even memorized our order without writing it down -- a party trick that has always impressed me. (Well, as long as the order comes out correctly. Which it did). 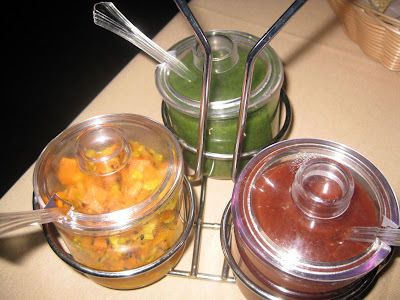 Pickled carrots, mint sauce, and tamarind sauce were also complimentary. Bobby picked the Lamb Curry. It was yummy. Plus, if you like lamb, you'll be happy to know that the restaurant offers nine different lamb entrees..
As usual, it was up to me to order a vegetable. I picked the Bengan Bhartha, described as fresh eggplant first roasted in a tandoor oven then cooked curry style with fresh tomatoes. It was tasty -- not the best Indian eggplant dish I've had but definitely above average. 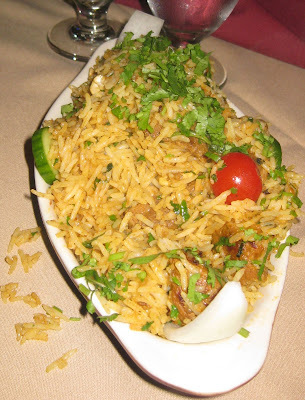 Nick's Lamb Biryani stole the show. Described as,Basmati rice cooked with tender pieces of goat meat in a blend of special North Indian spices, nuts, and raisins, it's flavoring was just superb. 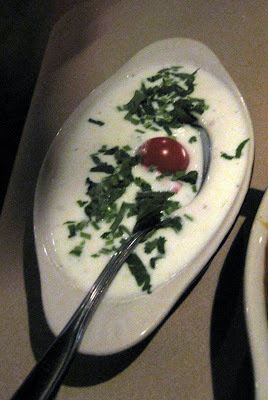 Raita, an Indian yogurt sauce, was included with our entrees. Nick and I have never cared for raita, but Bobby is somewhat of a raita connoisseur. He said it was up to par. After we were stuffed and had declined dessert, our server brought us each a complimentary dessert anyway. I'm not exactly sure what the motivation behind that was, but I suspect it may have had something to do with how, even sitting markedly far away from the banquet hall, we were still subject to its loud music and to overhearing the "talent" show (which included a very bizarre rendition of Taio Cruz's Dynamite). All three desserts -- carrot pudding, gulab jamun, and rice pudding -- were excellent. 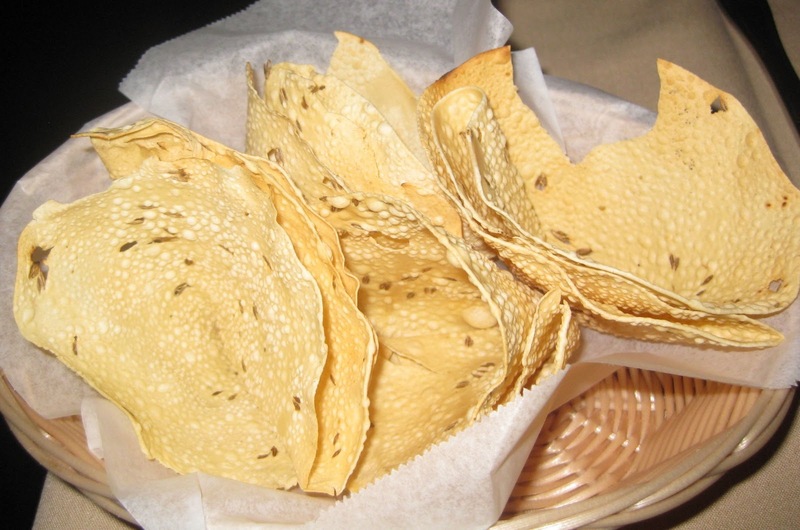 Have you been to Bombay Tandoori (or its sister restaurants India's Tandoori in Hawthorne or India's Tandoori on Wilshire in Los Angeles)? What is your favorite banquet hall for Indian functions in L.A.? 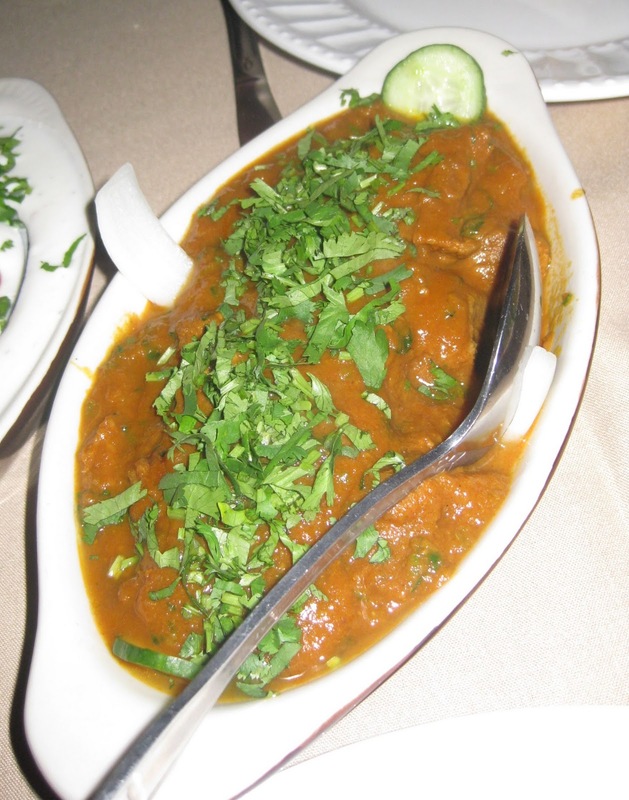 Bombay Tandoori & Banquet, 4111 Pacific Coast Highway, Torrance 90505. (310) 303-3185. I have been to India's Tandoori on Wilshire but I was not impressed! 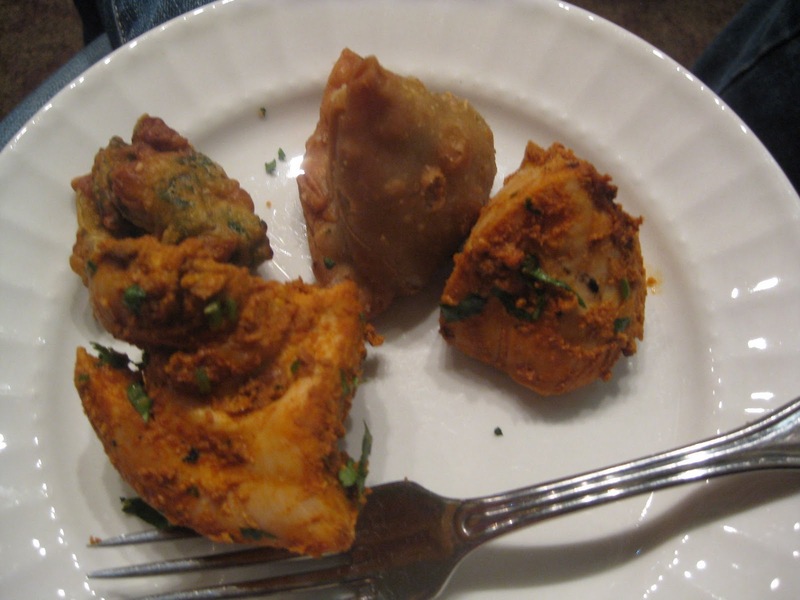 Despite visiting every Indian restaurant in Torrance (my parents leave near there) I have yet to find anything decent. But I actually haven't been to this place before! Thanks, Ameena. My favorite Indian restaurant in Torrance is Angara Indian Restaurant on Torrance Blvd., though I can only speak to the weekday lunch buffet. I haven't officially reviewed it yet on saagAHH, but will try to soon. Wow thanks foe share your conttent it is My favorite Indian restaurant in Torrance is Angara Indian Restaurant. There’s undoubtedly in which knowledge contains plenty of fat in the field of louis vuitton replica sale. Acquire that early on and also produce that persistently and you may attain significantly accomplishment on the market. Dying, some individuals haven't any difficulty discussing that although some will not. Irrespective of ethnicity, tradition, school, schooling, location or perhaps religion many individuals fake louis vuitton outlet will not have got anything at all to do with the subject of dying. Listed below are more effective causes folks dread dying. The particular Unidentified. Folks are not sure regarding just what dying really is. They will feel no-one is aware what the results are right after dying. Not necessarily comprehending just what comes after dying fake louis vuitton sale these. Carry out we all lose colour away from directly into nothingness or perhaps carry out we all carry on inside one more kind? They may be not sure whether they would almost everything right to worth a great afterlife. Which usually deliver us all to the next purpose we all dread dying. Non secular Concerns. Several peoples' concerns are usually non secular centered. Whether or not we all head to cathedral or perhaps not necessarily, Paradise or perhaps Hell can be a fake chanel bags which is inside our tradition. The reason why several change with a non secular trust is because of worries regarding dying. To have supporters several religions targeted peoples' fear of dying. The particular Passing away Method. Many individuals admit they don't really dread dying alone, merely the particular passing away method. Will there be soreness? Can they will perish on your own? Can they will put up with indignities? Many individuals would prefer to perish inside their slumber as compared to must fake chanel bags knowledge dying.